Chopper scam thriving despite Nepal's promised crackdown - Integration Through Media ....! KATHMANDU: Nepal’s pledge to crack down on fraudulent helicopter evacuations has failed to curb the scam, with tourists still being unnecessarily airlifted from the Himalayas so middlemen can profit on the insurance payouts, industry sources say. An AFP investigation earlier this year exposed the chopper racket where dodgy trekking outfits pressure tourists into needless and costly airlifts, or bill multiple times for a single flight. Nepal’s government launched an inquiry in June after insurers were billed more than US$6.5 million on 1,300 helicopter rescues in the first five months of 2018. Global insurers threatened to stop covering travellers to Nepal unless the frequency and cost of rescues fell sharply, worrying the poor Himalayan nation which relies heavily on tourism revenue. But industry insiders told AFP the scam was thriving well into the busy autumn trekking season, with operators continuing to make thousands evacuating tourists months after Nepal promised to rein in operators. “They (the government) came up with all these ideas but no one is following it,” said Jay Rana, who acts as an in-country agent for international insurance firms. Invoices seen by AFP show trekking agencies and charter companies are still overbilling insurers for rescues, collecting kickbacks between US$500 and US$2,100 per flight. The four chopper firms involved most frequently in rescues told AFP they carried out 489 airlifts in September and October. Industry officials say the helicopter companies tend to understate the true figure to avoid competition and scrutiny. An airport source, who requested anonymity, said more than 1,000 chopper airlifts were conducted over the same two-month period – with 68 recorded in a single day in late October. But Nepal’s tourism department – which started monitoring airlifts in September – claimed only 40 helicopter rescues had occurred in the two months to November. “There is a little bit of a problem with the system in coordinating with the (trekking and helicopter) operators,” conceded Dandu Raj Ghimire, director general of the tourism department, referring to the new rules the government implemented to curb the fraudulent rescues. But, he added, the chopper scam was “not a big problem nowadays”. Nepal’s trekking industry has become hooked on the kickbacks received from getting tourists evacuated by helicopter, said Rana. In one instance, a trekking company refused to share the location of a stricken tourist because Rana refused to pay the agency a hefty commission. “It was like a hostage situation,” Rana said, adding the trekker was eventually brought to lower altitude on horseback. The government has also not taken action against trekking outfits selling the below-cost Himalayan trips which are at the heart of the chopper scam. The budget outfits bank on making a profit through the commission they receive if a tourist gets airlifted. Some offer itineraries without acclimatisation days factored in, or have guides push tourists to skip their rest days, increasing the risk of altitude sickness and a possible airlift from the mountains. 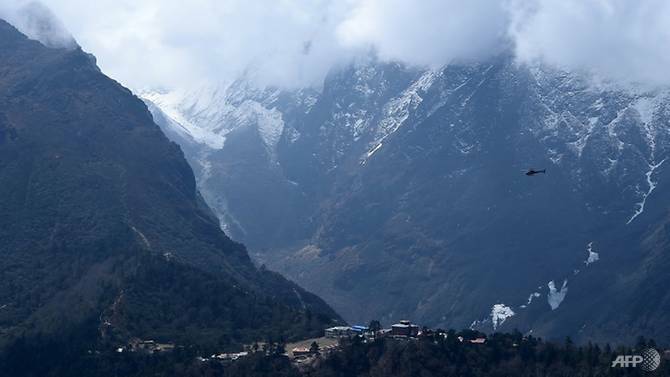 There are also reports of guides putting baking soda – a laxative – in food to deliberately make trekkers ill.
One tourist trekking in the Everest region in late October – who declined to be named – told AFP her guide advised that rest days were unnecessary. She was evacuated by a helicopter with altitude sickness halfway through her trek. The government’s probe has identified 15 companies – including helicopter firms, trekking agencies and hospitals – linked to the lucrative racket. But no action has been taken against any of the alleged perpetrators. “Nothing punitive is happening,” said Suraj Paudel, a Swiss-trained mountain rescue specialist. Insurance companies, however, are taking note. Since AFP’s investigation published in June, many UK-based insurers have hiked premiums or introduced special excess charges for helicopter rescues in Nepal. Anthony Kaye, of Campbell Irvine Insurance Brokers, described these steps as “a halfway house” and said it was only a matter of time before insurers stopped issuing policies for Nepal.